Aire-Flo offers good value in their product line. It is a Lennox brand so you can be assured that it is made with quality and good craftsmanship. This 13 SEER heat pump is a good choice in where a high-efficiency unit isn’t required. They are often installed in moderate climates and they work well in summer homes and cottages. These inexpensive heat pumps are also frequently purchased by homeowners who need a new heat pump but who do not plan to be in the home for more than a few years and would not get the long-term benefit from a high-efficiency heat pump. 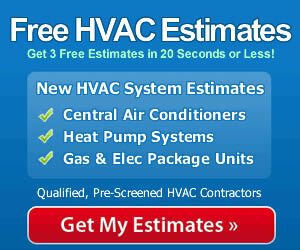 That’s the case with our HVAC prices post from Conrad that you’ll find below. With those suggested uses in mind, let’s take a closer look at the top features of the Aire-Flo 4HP13L18P heat pump. 13 SEER cooling and 7.7 HSPF heating. Multiple sound-reducing features including compressor blanket and discharge muffler. Direct-drive fan is precision-balanced for quiet, efficient operation. Coil features copper tube and aluminum fin design for effective heat transfer. Heavy-duty galvanized cabinet with durable powder-coating that resists fading and corrosion. Uses R-410A refrigerant that is environmentally safer than R-22. 5-year limited parts warranty, 1-year labor warranty; extended warranty is available. Here’s the post we received recently from Conrad in Burlington, WI. “Thanks for the helpful site! I’ve researched about a dozen heat pumps here but ultimately went with one I didn’t find here. Since there was no Aire-Flo 4HP13L18P heat pump review, I thought I’d add my 2-cents. I’ve had my house for sale for 18 months with no luck. The heat pump was 14 years old and I’d already replaced a fan motor on it. A few weeks ago when the coil started leaking I was hoping I could get away with a minor repair but the coil is shot. So I had to bite the bullet and get a new one. Thankfully I can get by right now weather-wise without one so it gave me time to do some research on heat pump prices and models. I took a hard look at the Goodman GSZ13 and the Payne PH13NA, both 13 SEER models. In one case I was doubtful about the contractor. On the other, doubtful about the brand. I’ve always liked Lennox products and knowing the Aire-Flo is a Lennox brand gave me confidence to check it out. The price was definitely right – less than either the Goodman or the Payne – I heard several good comments about the contractor when I asked around. I signed the deal to have it installed. The installation went pretty well. The owner who sold me the unit was here and then gone while he left a young technician to handle most of it once it was set outside. The guy was on the phone to the boss a couple of times and I was concerned he didn’t quite know what he was doing. However, when he called in to say he was done, the boss came over and they went through a complete checklist of things to check, making sure it was run-tested and adjusted properly. I’m pleased with the result, and it didn’t cost me too badly. Now if I can get this house sold I’ll be all set! Budget-minded consumers sometimes make a mistake that serves to blow their budget in the end. That mistake is to attempt to install a heat pump when they don’t have the experience. HVAC equipment is notoriously hard to install, even for guys with very good do-it-yourself capabilities. It requires skills, equipment and tools that most of us don’t have. Plus, it is something that needs to be done with great precision or the unit may run inefficiently or experience mechanical failure, both of which are costly. Hiring a qualified contractor makes the most sense for installation of the Aire-Flo model 4HP13L18P heat pump or just about any piece of equipment. The risk of doing it yourself and not getting it right usually isn’t worth it. Keep that in mind as you shop for your next heat pump or system.